Calling all those who have an interest in learning the Chinese language: if you are planning to travel to China or you have Chinese friends or co-workers, then you may want to learn at least the basics. The Chinese by Living Language app can be used on your iPod touch, iPad, and iPhone to acquaint yourself with the language through an in-depth course. In this educational app there are a number of lessons you can take part in broken up into three levels which are essential, intermediate, and advanced. 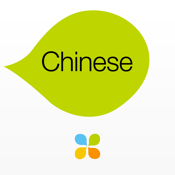 This app makes it possible for you to completely immerse yourself in learning Chinese. It really doesn’t matter what your knowledge level is when you start this app: you'll enjoy it whether you have zero experience or have some experience under your belt. The app has been built so that all levels of knowledge can benefit from it. As mentioned there are three levels and 46 lessons. Also included are comprehensive grammar notes, vocabulary flashcards, the ability to speak with native speakers, plus a variety of interactive games. The free version of this app works almost as an introductory. You are given a number of free lessons and from there you can purchase the full app or individual levels. These purchases range from $3.99 to $9.99, which is much cheaper than signing up for a language course. As soon as you launch this app you will be jumping right in by taking part in lessons immediately. What's great is that once you download the app on one device you'll be able to use it on all your devices. This means it's always convenient and on-hand for you to use. Another big pro about this app is that it's more than just the basics. There are plenty of language-based apps that give you the basics but then leave you struggling when you want to go further. This app is meant to be a complete course giving you everything you need to speak Chinese words and then full phrases. It’s not about “just getting by,” it’s about giving the user a strong grasp on things. The app has a pretty solid four out of five star rating from users who are generally quite satisfied with the content and pleased with the user interface. Speaking of the user interface, this one is clean and simple, which makes the learning process a whole lot easier. The Chinese by Living Language app can be used on your iPod touch, iPad, and iPhone to help you not just learn the basics but master a number of words and full phrases in Chinese.